These images produced by the Lyman Alpha Mapping Project (LAMP) aboard NASA's Lunar Reconnaissance Orbiter reveal features at the Moon's northern and southern poles in the regions that lie in perpetual darkness. They show many permanently shadowed regions, or PSRs, are darker at far-ultraviolet wavelengths (top inset) and redder than nearby surface areas that receive sunlight (bottom inset). 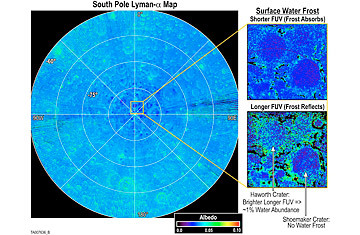 The darker PSR regions are consistent with having large surface porosities  indicating "fluffy" soils  while the reddening is consistent with the presence of water frost on the surface. There are a whole lot of forbidding places in the solar system, but the permanently shadowed regions (PSRs) of the moon have to be near the top of the list. Found in the northern and southern lunar poles, the PSRs are low-lying spots  often deep in the bowls of craters  that never receive so much as a breath of warmth or a flicker of light from the sun. As a result, they don't go through the same heating and cooling cycle as the rest of the moon, where temperatures soar to 200°F during lunar daylight and plunge to 200°F at night. Instead, the PSRs remain in an unending deep freeze. That ought to make those areas unlikely places for astronauts ever to visit, much less settle  except for one little wrinkle: if there happened to be water ice nearly anywhere on the surface of the moon, it would boil away the instant it felt the solar fires; at the poles it would last forever. In 2010, scientists discovered that even at lower latitudes, the moon is not entirely dry, with faint traces of ice surviving beneath the surface, making lunar soil about twice as wet as the sands of the Sahara  which by moon standards is practically drenched. Now, NASA's Lunar Reconnaissance Orbiter (LRO) has found that the PSRs indeed have a whole lot more water than that, with up to 2% of the surface in those blacked-out regions consisting of ice crystals. Water ice was likely imported to the moon by incoming comets, a bombardment similar to the one that many astronomers believe helped fill the earth's oceans. Our planet's dense atmosphere and comparatively powerful gravity would have kept the water in place. The small, airless moon would have frittered most of its into space  except on the poles, that is. To test that theory, the LRO trained its eye down on the dark polar regions, using an instrument appropriately named LAMP (the Lyman-Alpha Mapping Project). The LAMP system analyzes the spectrum of different species of hydrogen ions, a technique that is typically used to study the deep-space interstellar medium, but on the moon can reveal the presence of water molecules  which, after all, are two-thirds hydrogen. In this case, LAMP revealed extensive areas in the PSRs that showed up in one of two wavelengths: the dark ultraviolet and the deep infrared. The ultraviolet readings indicated soil regions that are more porous than other parts of the moon, giving them an unexpected fluffiness. "LAMP's technique supports a fairy castlelike arrangement of grains in the PSR soils," said senior research scientist Kert Retherford. The fluffy regions, however, could not be wet, but there were plenty of other regions that glowed in the far infrared. This indicated water ice  and lots of it. Not only are the PSRs wetter than the soil on the rest of the lunar surface, they are also losing what water they do have at a much slower rate than thought. Even in a permanently dark region, a volatile substance like water would eventually degrade, but given the age of the moon and the quantity of ice found, the LRO scientists believe this is happening 16 times slower than earlier estimates suggested. None of this makes the moon a wellspring, and it would have a long way to go before it became a remotely hospitable place. But a sine qua non for any lunar base would be a steady supply of water, and transporting even a little bit of it from earth would be very difficult and prohibitively expensive. Knowing that there would be a steady supply on hand for drinking, raising food in greenhouses and even manufacturing rocket fuel allows space planners to check at least one essential box long before we even consider a lunar journey. Now all we need is the will, the wallet and the technical know-how to check all the rest.